In February 2004, when her American husband, a recently ordained Zen monk, leaves home to train for a year at a centuries-old Buddhist monastery, Tracy Franz embarks on her own year of Zen. An Alaskan alone-and lonely-in Japan, she begins to pay attention. 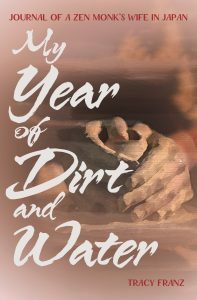 My Year of Dirt and Water is a record of that journey. Allowed only occasional and formal visits to see her cloistered husband, Tracy teaches English, studies Japanese, and devotes herself to making pottery. Her teacher instructs her to turn cup after cup-creating one failure after another. Past and present, East and West intertwine as Tracy is twice compelled to return home to Alaska to confront her mother’s newly diagnosed cancer and the ghosts of a devastating childhood. Revolving through the days, My Year of Dirt and Water circles hard questions: What is love? What is art? What is practice? What do we do with the burden of suffering? The answers are formed and then unformed-a ceramic bowl born on the wheel and then returned again and again to dirt and water.